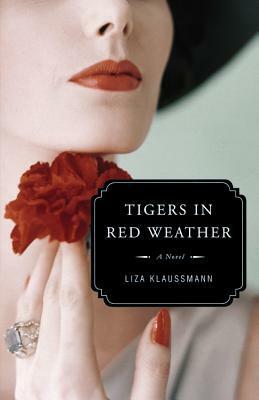 I’m not quite sure what I feel about Liza Klaussmann’s Tigers in Red Weather. The book jacket compares it to the work of F. Scott Fitzgerald (“tempestuous elegance”) and Patricia Highsmith (“dark suspense”), and those are pretty big shoes for any book to fill. Yet when I started the book, I agreed absolutely, at least with the Fitzgerald comparison. The first few chapters of Tigers, told from Nick’s point of view, are indeed as lushly evocative as The Great Gatsby. 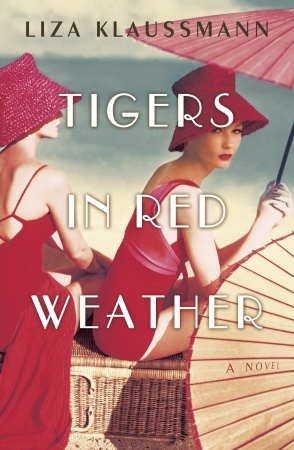 Set in the 1940s, these chapters utterly transported me to a different world, a different era, where women wore gloves and drank martinis in lounge cars. In one of my favourite passages, Nick and her husband Hughes treat themselves to dinner in a restaurant far above their means. Because the food is so expensive, Hughes says they can only afford “two martinis and a bowl of olives and celery.” The “urbane 21 Club” boasted among its clientele Humphrey Bogart and Lauren Bacall, and Nick and Hughes happened to be seated at the table where Bogart and Bacall had their first date. “That’s a rarity.” The man chuckled. It’s a glorious experience, even just reading about it, and along with the Fitzgerald similarities, I found myself also being reminded of Hemingway. Klaussman’s dialogue is sharp, succinct and wonderfully multi-layered. If the rest of the book were like that, I would be completely in love with this novel, probably would have gushed about it as one of my favourite books of the year. Unfortunately, the rest of my reading experience was uneven. There were moments when I’d be struck by a certain passage, or when I’d get excited about a particular bit of writing. Then there were others when I’d find myself skimming the text, wondering where the magic went. It may be that my reading experience was more affected than usual by my mood (I don’t usually have such fluctuating reactions over a single novel) or perhaps my expectations after the first section were incredibly high. I just know that when Nick and Hughes’ daughter Daisy came into the picture, the story turned ordinary. Tigers is the story of Nick and her cousin Helena, their husbands Hughes and Avery, and their children Daisy and Ed. The story begins just after World War II and, after the first section narrated by Nick that I loved so much, revolves around the time Daisy and Ed discover a dead body. This is where the Highsmith comparison comes in. I normally love mysteries, but I couldn’t get into this one, and I think it’s because the focus wasn’t really on the whodunnit angle. Rather, the story, narrated by Daisy at this point, seemed more focused on a boy she liked than on the mysterious death. Later, we hear about the incident from Hughes’ point of view, and that’s when we get a chilling revelation that suddenly grabs my interest again. Unfortunately, again the focus shifts away from the death to Hughes’ relationship with Nick, and far from the dramatic tension in the first section, this narrative felt more detached, which just made me not care. I think a major part of the problem is that the characters are vastly uneven as well. Nick and Hughes are fascinating, but their daughter Daisy, though she has some moments to shine, just didn’t grab me. Helena and Avery had the potential to be interesting — Avery has an unhealthy obsession and Helena is in denial. Unfortunately, Helena just struck me as utterly colourless, and Avery was never really explored. Their son Ed has a dark side that could have made him the most interesting character in the book, but again, we barely touch the surface with him. The book itself is beautiful — just look at that cover art! I’m also really partial to this audiobook cover art by Hachette (left). Unfortunately, the book was just too patchy for me to really love it. Some parts did completely blow me away, but others just made me want to skim. I also hated the ending. In the middle of the last chapter, I actually commented on Goodreads “WTF? !” It just felt like it came from out of nowhere, and various conclusions and generalizations were made about characters that made me just scratch my head. Overall, however, still a good book, and certainly worth checking out for moments of brilliance. Thank you to Random House Canada for a finished copy of this book in exchange for an honest review. I agree that the character of Daisy really left me wanting more, especially with what her parents were like. I did enjoy this and felt that many of the passages were beautiful like you said. Love your review, and I’m glad you still found things to enjoy about this book.